Forgot iTunes Backup Encryption Password, How to Recover? Posted by Vicky Tiffany on Dec.12, 2015 19:54 PM. Mobile device has become an important part of our daily life. We store a lot of staff such as contacts, text messages, familiar photos, our favorite music, or the payment information. Those kinds of data are in a great value so we should take good care of them. Backup is the best and easiest solution to keep our data in a secure place. As we known, iTunes is the recommended tool to back up and restore our iPhone, iPad or iPod. Although iTunes is pretty hard to use in some aspects, we can't live without it if we need to back up our iOS device. What's more, iTunes enables us to set up a password on backup files so unauthorized access would be blocked. iTunes makes it possible for you to be able to encrypt and decrypt iPhone backups when it comes to syncing your device. As a result of security purposes, this backup is essentially protected by a unique password. Unfortunately however, if you individual forgot the iTunes backup password, the iPhone backup will not be unlocked with a wrong password. In a situation like this, the iPhone cannot be restored from the encrypted backup. And you're going to lose all of the files forever if you wouldn't recover the password. Luckily, there are two solutions available when it comes to recovering forgotten iTunes backup passwords on Windows and Mac OS X. Let's take a more detailed look at the two options that are available to you. * Your Apple ID password. * Your Windows administrator account password. 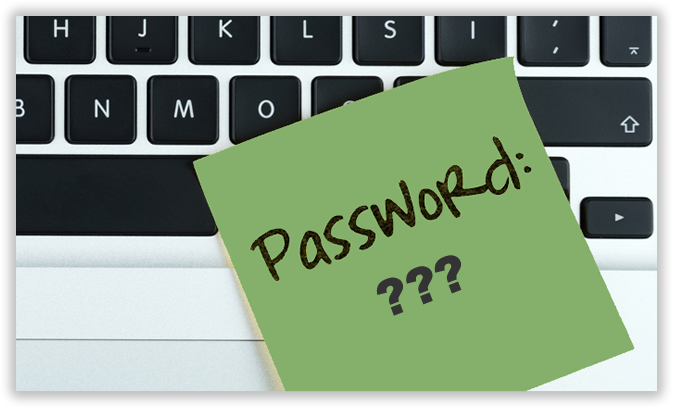 * Most used password for online registration, such as forums or social media accounts. * Commonly used passwords, such as 123456, abcdef ,000, 6789, etc. * Different variations of your family member's birthdays or names. 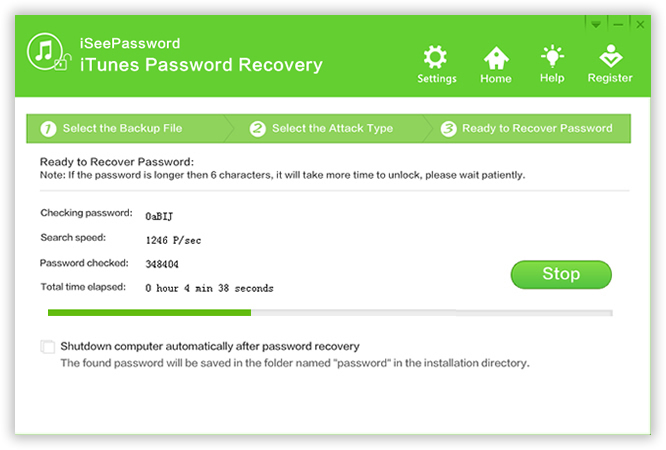 The second and most effective solution is the utilization of a backup password recovery tool. 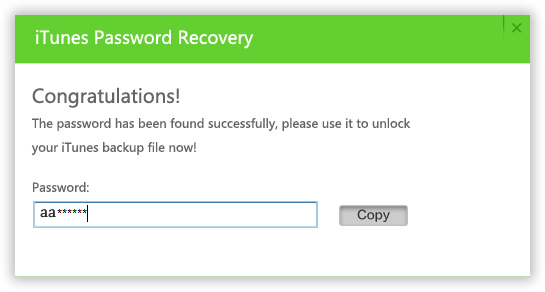 A backup password recovery tool is a specially designed tool that iPhone users can utilize when it comes to recovering forgotten iTunes backup passwords on Windows or Mac OS X. While it may be true that there are several tools that are available, one of the most effective tools within the industry is iSeePassword iTunes Password Recovery. As far as how the password recovery tool works, it can help to recover your password by utilizing four different powerful password attack techniques. 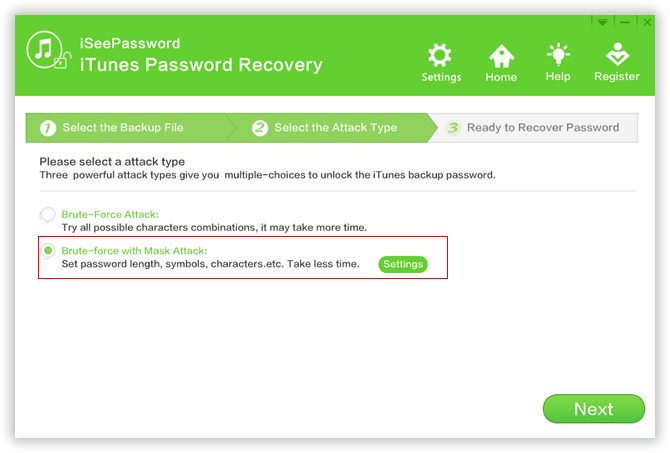 3 ways to recover your forgotten iTunes backup password, 86% successful rate. Automatically identfy your backup file, and scan with the advanced cryptography algorithms. Built-in NVIDIA-GPU algorithms can greatly accelerate password decryption speed to 30X faster. Support for iPhone 8/7S/7Plus/6 Plus/5 and iPad and iPod. You can download the trail version to give it a try. * Brute-Force Attack- This attack consist of utilizing various character combinations in a user specified range. For example, if the user believes his/her password was a combination of letters and special characters such as $ or % for example, the tool will use a combination of words and special characters to recover the password. * Brute-force with Mask Attack - This attack is ideal for users who partially remember their passwords. This attack consists of utilizing all possible character combinations such as caps lock on/off words, numbers, special characters. 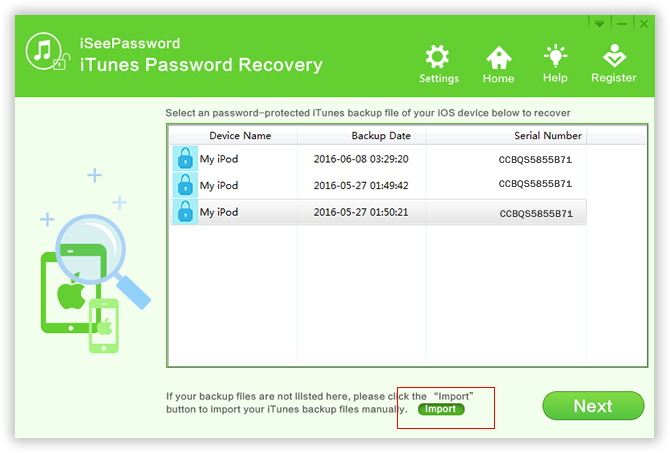 It can significantly reduce the recovery time it usually takes to recover a forgotten iTunes backup password. You need first download and install the program (Windows or Mac) before you could do anything else. The installation is straight forward, which is the same as most of other software installation. Open the program when installation is completed. Click "Import" button located at the upper corner of the program. It will load all backup files automatically. Click "OK" to get the file being selected. If the backup file was not listed in here, choose the "Add File" button to select the backup file location you know. As you can see, there are 4 recovery options built in the program for your choice, including Brute-force Attack, Mask Attack, Dictionary Attack and Smart Attack. 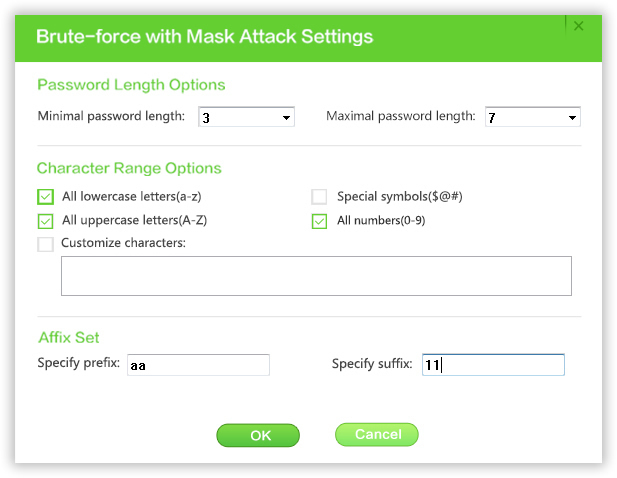 If you remember part of symbols of your password still, I highly recommend using Brute-force with Mask Attack mode as it can perform a fast computational and recovery speed. Otherwise, it's quite smart for you to choose Smart Attack at first. So you need to select the proper attack mode. When you select the Brute-force Attack or Mask Attack scanning mode, this program will perform every possible combination of characters in the specified Range you set. As to this attack mode, you should set the 'Password length' and 'Character Ranger' Options. The more accurate the information you can provide for each options, the better and faster the work will get done and the easier it will be for everyone. There are many flexible features added in the program and suppot multi-core CPU and NVIDIA-GPU, which can accelerate password recovery process efficiently. Stop/Save: You can directly click the "Stop" button to pause the process, then click "Save" the project for next use, this allows you to continue your last search record without re-scanning. 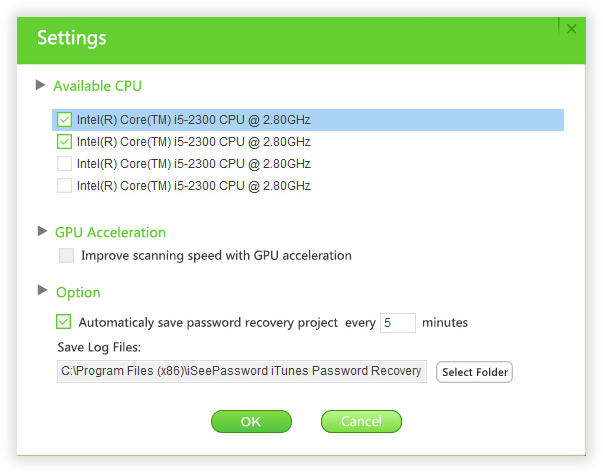 Pause/ Resume: You can click to 'Pause' button to pause the searching, then click 'Settings' to select 'CPU' or 'GPU'. Then click 'Resume' to continue searching. Click "Start" button to start the recovery process. You will get your lost iTunes password soon depending on how complex the password is. When you successfully recover the password with this iTunes password recovery, the Dialog box with passwords will be displayed. On the pop-up password window, Click "Copy" button and paste the password in the textbox. 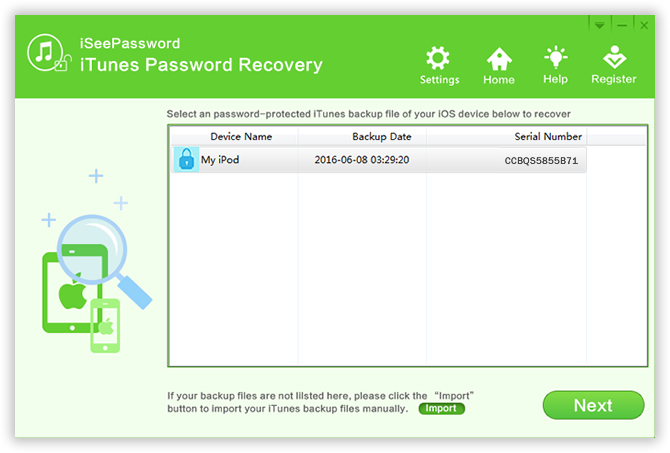 If you have been unable to restore your iPhone backup due to a forgotten iTunes backup password you need not worry, as mentioned before, if solution 1 does not work, rest assured that you will be able to recover your forgotten password via the utilization of solution 2. As a matter of fact, the company behind iTunes Password Rescuer is so confident in their product that they offer a free trial as to which you can use to evaluate to determine if it's the right solution for your problems.